Dedicated to the ten Revolutionary War soldiers buried in Haywood County, this plaque is mounted on the rough face of a five foot tall stone tablet. On Armistice Day 1922, the monument was unveiled. Miss Jessie Rogers, Chapter Regent, presided over the ceremony. The exercises began with a patriotic song and an invocation by Reverend S. R. Crokett, who had been a chaplain in World War I. The keynote speaker was Colonel Albert Cox, who was an officer in the 113th Field Artillery in World War I. He was introduced by Major J. H. Howell. Miss Jessie Rogers then introduced the tablet and gave a brief overview of each soldier’s history. The tablet was unveiled by four great great grandchildren of the Revolutionary War soldiers on the plaque: Robert Love Sloan, Martha Sloan Way, Josephine Plott, and Hardin Howell, Jr. 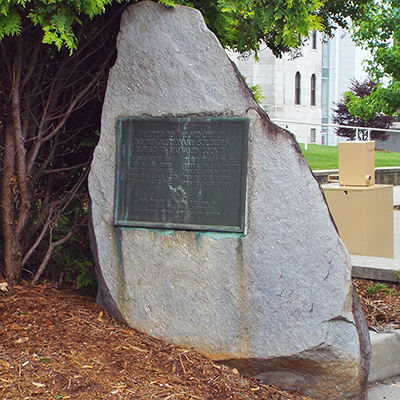 The monument is located southeast of the Old Haywood County Courthouse at 215 N. Main Street, Waynesville, NC., at the intersection of Main and Depot Streets. Nearby is the Haywood County Confederate Soldiers Memorial, Haywood County All Veterans Memorial, Haywood County Korean War Memorial, and Haywood County Vietnam Memorial.